FBC Jax Watchdogs: David Hughes to Teach Pastors on Topic "Transitioning Without Body Bags"
If the "back door" is really a sewer for "excrement", then no "body bag" is needed! Expect his message will not be accurate if he thinks there were not casualties from the transition. Quite a few former members, including myself and my family, left the church after they went seeker-driven and refused to hear constructive criticism from people who truly cared about the church and the leadership. It took a while for my family who stuck it out because of the relationships they had with people in the church. But in the end, the lack of Biblical teaching left them Spiritually starving, as it does for all discerning Christians who know their Bibles. 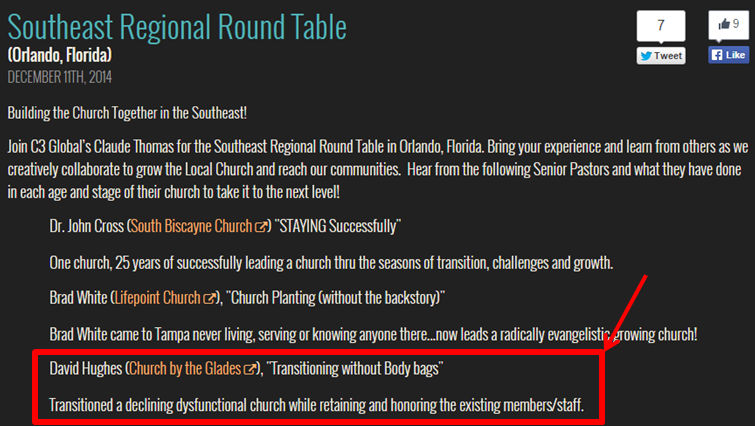 FYI - the church was specifically being mentored by Dan Sutherland of Church Transitions, Inc. and former pastor of a church down the road called Flamingo Road Baptist Church (now Potential Church). It's disheartening to me that now David is partnering with Ed Young and spreading this "doing church for the un-churched" message to other potential church leaders and pastors. David Hughes was mentored and groomed by Dan Sutherland, formerly of Church Transitions, Inc. and former pastor of a church right down the road called Flamingo Road Baptist Church (now Potential Church). This teaching based on the title alone will be disingenuous at best...many former members became "body bags" after the church transitioned to a seeker-driven model. My family was included in this, and they stayed as long as they could because of relationships built with other people there. The leadership (including David) would not listen to constructive criticism because those people were not getting in line with the vision for the church. It's disheartening to me that now David Hughes is partnering with Ed Young and spreading this Spiritually-destructive message to other leaders in the church. Even though I'm only 40 I can remember a time when pastors didn't use idiotic corporate-speak jargon like "transitioning" and "body bags"
Every day I earnestly pray for the death of the American megachurch. i implore everyone else to do likewise. It may be time for us to start fasting for it too. Can we have a conference on how to transition these self-appointed, self-righteous people from the pulpit to the pew? Here's a 2-point plan to transition these folks out of power & influence. 1) Stop going. 2) Stop giving. "Some of these guys don't need to transition to the pew, they need to transition out the door...."
True but then we would not be "seeker friendly" would we? Anon 3:58 - no pastors in particular. Many mega church pastors (most?) view themselves as "called" by God, hired by God, and working and speaking directly for God. If your pastor arrogantly pronounces this to the church, you should be very, very concerned. Wise, as much as I'd love to be " seeker friendly" to these guys ( and girls) they'd see it as a sign of weakness and take advantage of the situation. Watchdog> Your 8:08 comment. You are absolutely correct about pastors who claim they have heard God talk to them personally. I wonder whose voice they heard and in what language. My parents and I are well over 200 years old together and we have never heard from God directly except in His Word. Those that claim differently are giving anyone a false message. Additionally, did God tell each of them what salary and perks they were to receive once they were situated in the church that actually pays them Big Bucks? Thank God you have discernment. Jax...was missing you for this time of quiet posts. Glad to see your spark again. Fighting For The Faith has covered David Hughes for many years now...and www.alittleleaven.com has some videos in the archives that would make one question the sanity of that church and those who attend. This type of nonsense from the mega pastors should raise alarms that a fire is brewing yet the sheep remain and do not run from the fiery pit of false teaching & false doctrine. So kudos to your posts, and always pleasurable to have you as a brother in Christ. It's really a shame that you are all so dead set against megachurches, especially ones like Church by the Glades that regularly preaches the gospel (yes, the ACTUAL gospel that Jesus dies for the sins of the world). What concerns me so much is that you completely disregard about half of the book of Acts. Not only were at least 3,000 added to the church in one day (a megachurch), you've forgotten Acts 17. Some churches operate in a culture where being an Acts 2 church, reaching those who already believe in God but pointing them to Christ, works really well. BUT some church, like Church by the Glades, are in a culture where only an Acts 17 Mars Hill approach works. They use the language and idols of the culture to remove barriers to bringing people to Christ. That's what Church by the Glades does. That's who Pastor David Hughes is. I would kindly point you to the wisdom found in Psalms 34:13, Psalm 141:3, Ephesians 4:29, Titus 3:2, James 4:11, Proverbs 26:20, James 1:26, 1 Tim. 5:13, Leviticus 19:16, Psalms 50:20, Proverbs 10:19, Prov 18:6-7, Proverbs 21:23. Pastor David Hughes has had an amazing impact on my spiritual journey. His emphasis on the Bible and daily reading of God's word has brought me back to a personal relationship with my Lord and Saviour, Jesus Christ. Watching David preach has moved me to read the Holy Bible and devote time each day to prayer. David always gives the Glory to GOD and I for one have been moved by David's humility and passion.